After dining at the infamous Savoy Grill, Winston Churchill once stated: "When I die, and if I have a choice, I'd rather have The Savoy staff looking after me in heaven instead of angels." This is just a snippet of the iconic hotel's colourful past and today the creation of Richard D'Oyly Carte is still one of London's most luxurious destinations. The hotel of firsts continues to lead the way in luxury accommodation and dining. 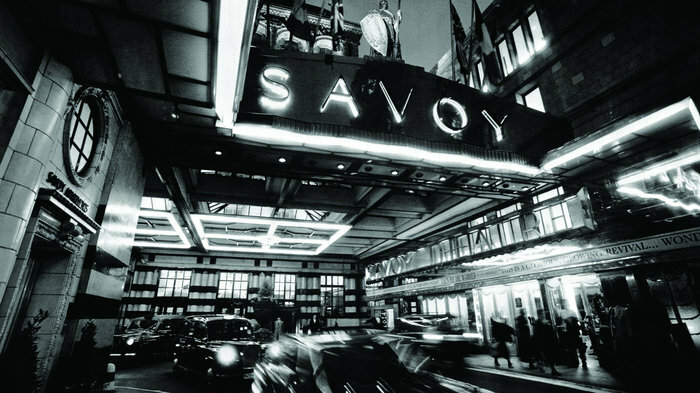 Established in 1889, The Savoy is a Victorian creation of quite astounding magnificence, and as such a London landmark. It led the way in technology - being the first hotel to use electric lights and elevators - and has a long history of fine dining and extravagant parties, such as the lavish Gondola party in 1905 for American millionaire George A Kessler. In order to resemble Venice, the central courtyard was flooded with water, white doves were released into the air, diners were seated on a gondola, and a baby elephant presented the five-foot birthday cake. Such indulgences would explain the need for one of the most ambitious restoration programmes in Britain in 2010. Pierre Yves Rochon's three-year, £220-million redesign combines the art deco and Edwardian styles of the original and involves the complete building, including the courtyard, all the public areas and guest rooms. The hotel's fine dining is reflected today in the Michelin-starred Savoy Grill, Kaspar's Seafood Bar, American Bar, Beaufort Bar and the Thames Foyer. 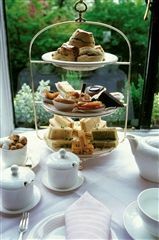 Finger sandwiches and homemade scones are served in the grand Thames Foyer. The Thames Foyer, where tea is served, is a grand as the rest of The Savoy with a fabulous collection of art deco mirrors adorning the walls and a striking glass dome that floods daylight over a garden gazebo, where a pianist takes centre stage to serenade diners. Served on delicate Royal Doulton bone china, the attention to detail is superb. Sandwich fillings range from lemongrass chicken salad to smoked and poached salmon with dill mustard, while freshly baked scones are served with Cornish clotted cream, homemade lemon curd and strawberry preserve. The indulgence continues with a selection of delicate tartlets, macaroons and eclairs, and a conclusion of signature cakes such as banana pecan and chocolate fudge. Don't forget to try the Savoy Blend tea either, it's quite unique. This glamorous, moodily lit restaurant has a wide offering of meat dishes. The Savoy Grill, along with The Savoy Hotel, reopened in 2010 following a three-year £220m refurbishment to reveal a "moodily lit" and "glamorous" dining room with "dark, lacquered walls that give the impression of being inside a glowing tortoiseshell box" (The Independent). Gordon Ramsay, who first took over the Grill in 2003, is back with Head Chef Andy Cook delivering a menu that returns to the classic Escoffier-inspired grill rooms. As you'd expect, grilled meats feature heavily. In addition to the steaks there's Herdwick lamb cutlets, Dingley Dell pork chops and mixed grill as well as a trolley taking the roast of the day to your table (roasted rack of rare breed pork, roasted loin of suckling pig...). There are non-meat options like Omelette Arnold Bennett (an invention of the Savoy), baked scallops and glazed lobster thermidor and there's even a separate vegetarian menu. Though it seems silly to go to the Savoy Grill and not order meat. In short, The Savoy Grill has a long tradition of serving excellent food to London's more discerning visitors and in its latest guise continues to keep up with modern day demands. An all-day restaurant named after the hotel's lucky charm, Kaspar the Cat. The legend of Kaspar the Cat lives on in Kaspar's Seafood Bar and Grill, The Savoy's brasserie style restaurant which opened in May 2013 in place of the River Restaurant that emerged from the hotel's £220 million renovation completed in 2010. Less formal than the restaurant it replaces, Kaspar's is an all-day dining affair, with a wide range of cuisines and a show stopping seafood bar at its centre, displaying shellfish, cured and smoked fish. While the Evening Standard restaurant critic Fay Maschler says, "do not bother with Kaspar's lobster club sandwich", lamenting the "hefty, clumsy assembly" and lack of lobster, there are redeeming features including the elegant 1920s-style setting, the extensive (if expensive) wine list and the fact that this is The Savoy where Winston Churchill would insist that Kaspar the Cat join him at his dining club meetings. Money can't buy a pedigree like that. This little restaurant is opulent, affluent and extravagantly luxurious. This traditional bar still serves cocktails from the legendary Savoy Cocktail Book. During The Savoy's £220million refit the American Bar was barely touched, ensuring it stayed true to its traditional, sleek design that is synonymous with the iconic drinking destination. This move was clearly a clever one after the bar was voted the world's best in the 2017 World's 50 Best Bars ranking. The white decor, art deco mirrors and fittings, polished piano - used for live American Jazz seven nights a week - and Terry O'Neill monochrome portraits come together to form one of the capital's most stylish bars. The award-winning team of bar staff still refer to the legendary Savoy Cocktail Book that is considered 'the bartender's bible'. Written by Harry Craddock, the head bartender in the 1930s, the book contains cocktails such as the famous White Lady, which is made with Bombay Sapphire gin, dry orange liqueur, fresh lemon juice and a dash of egg white. As well as these traditional choices, the bar aims to serve classic drinks that appeal to the modern palate. Plush bar with one of London's most extensive selections of champagne. The second of two bars in The Savoy, The Beaufort Bar is a glamorous affair. The bar continues the hotel's Art Deco theme with plush black velvet furnishings, gold decor and £38,000 of gold leaf. Guests are spoilt for choice when it comes to bubbly as the bar boasts one of London's most extensive choices of champagne, including rare vintages from Louis Roederer. Standing on the hotel's former cabaret stage, the Beaufort also continues the tradition with cabaret and burlesque evenings. Hosted by Miss Polly Rae, the evenings welcome an array of guest stars such as Shimi Goodman who starred in Andrew Lloyd Webber's musical From Here to Eternity; international burlesque and cabaret star and classical pianist Chrys Columbine; and acrobatic performer Sammy Dineen. Established in 1828, Simpson's-in-the-Strand is renowned for its great British roasts. Simpson's-in-the-Strand is an excellent choice for "high-class comfort food", so says The Telegraph whose well-heeled readers will feel perfectly at home in these grand surroundings. Established in 1828, it is renowned for its great British roasts, carved at the table from magnificent silver-domed wagons. With its oak panelling, leather and lofty ceilings, this famous establishment has all the atmosphere of a private club. As well as speciality aged Scottish beef and other roasts the menu offers a wide range of classical dishes including potted shrimps, roast saddle of lamb and steak and kidney pie. Breakfast, lunch and dinner are served in the ground floor restaurant while the Knight's Bar, an art deco cocktail lounge on the first floor, is the perfect place to enjoy a pre-dinner cocktail or after-dinner aperitif. From cheap budget accommodation to luxury 5 star hotels see our special offers for hotels, including Holiday Inn Express London- Vauxhall Nine Elms from 57% off.